During his college years, now-professional driver Tanner Foust’s career plan was for people seeking medical attention to line up in his waiting room. Life didn’t exactly go that route. Instead, people line up waiting for his autograph — no medical concerns required. 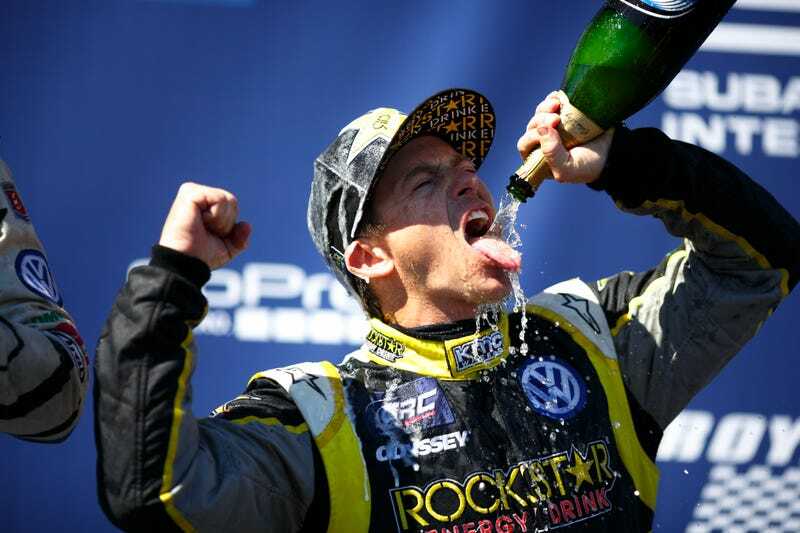 Ahead of this weekend’s doubleheader in Barbados, two-time series champion Foust, 42, sits sixth in the Red Bull Global Rallycross championship standings, and he and his ridiculous yellow 560 horsepower Andretti Rallycross Volkswagen Beetle are unquestionably among the sport’s top stars. And though Foust holds honors including two Formula Drift championship trophies in addition to his GRC titles, a stash of X Games medals and a starring role on History Channel’s Top Gear USA, he always envisioned a more traditional career path. Foust is one of the most eloquent and casually conversational interviews around between the bits of humor, and that’s because he’s got more than just the car knowledge — he’s book smart from four years at the University of Colorado. But after graduating on the pre-med track, Foust shifted his goal from framing a medical degree to filling up his shelves with racing hardware. Just how all of this played out is where it gets interesting. So naturally, I called him up and asked. “Are you sure you want to go down that path?” he laughed back. Foust took a liking to racing — particularly rally racing — as a kid, learning to drive on country roads while living in Scotland as an American military brat for part of his childhood. But he chose to take the conventional path of attending school and getting a more realistic job, because a gig in the world of racing “just never seemed like a real possibility” for his inner car enthusiast. The steps he was able to see lied in higher education, so Foust entered the aeronautic-engineering program. In that field, he “could visualize what the job would look like” — it’s almost punny, since he wanted to be the person visualizing airflow off of grooves in a wind tunnel. But if you’re catching onto the pattern here, college didn’t work out the way he thought it would. The biology major began diverting from his medical-career plan during his last couple of years at the University of Colorado. So rather than spending his extracurricular time in the biology labs, Foust worked with an inventor of (wait for it, wait for it, wait for it...) amusement-park rides. Neither practicing in medical field nor dreaming up amusement parks would be his ultimate destination, but working with inventor Bill Kitchen gave Foust a new outlook — “making money for what you think is fun,” Foust learned, is contagious. While he didn’t go through a fighter-pilot period during his career search, Foust did realize that he wasn’t looking for a nine-to-five job. He wanted something out of the ordinary. By his junior year in college, Foust’s life had already come full circle — the kid who learned to race on the Scottish country roads finally decided to pursue motorsports as a career after graduation. Because he was only volunteering in exchange for the seat time after college and needed some alternative way to make money, “there were three years of basically just a little bit of bullshitting” at the racetrack to compensate. For $120 per day, Foust would coach a group of three or four guys out on the track to help cover the costs of the volunteer lifestyle. And each “student” got faster, with just one main tip. Foust took his coaching to the “nth degree” (all of those years in school at least gave him a way to describe his racing success), teaching left-foot braking, sliding around corners and all the rest to everyone from military programs to casual students while also participating in SCCA racing himself. “The road racing just wasn’t working out,” Foust said. “It’s so expensive — and everybody had dads who were pretty rich, and it was annoying. Foust fought into the higher ranks in 2003, when he began his professional driving career and moved to California to pursue it. It wasn’t rally where he first got his shining moment as a driver, though — it was in drifting. There, he began to understand the business of motorsports. From drifting to rallycross (both abroad with FIA World Rallycross and domestically with Red Bull Global Rallycross, in which he currently competes for the Andretti Autosport group), helping to grow something new has been Foust’s M.O. While Foust admitted that it “seems a little sacrilegious to some” to remove the glamour from motorsports and view it as a business, that’s fundamentally what makes sense. The business approach allowed him to see the progression to actually racing cars — something that stumped him for years. Yeah, that’s definitely the dream. And he recognizes it. “This is so far beyond anything I dreamed of,” Foust said. “Again, I never could visualize racing cars as a job.